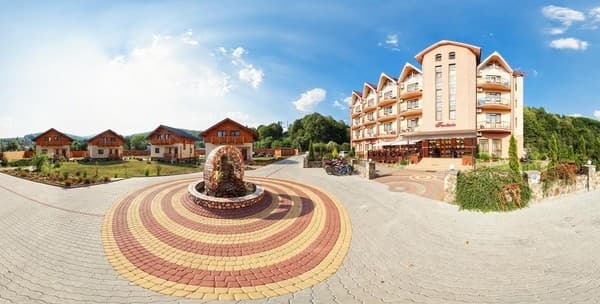 Spa Hotel Fantasy is located in the famous balneological resort of the picturesque Transcarpathia in Polyana, at an altitude of 340 m. Fresh air and mild climate give rest to their healing power, and the beauty of the surrounding nature will help to relax from the workplace. The hotel "Fantasy" is a 5-storey dormitory, the number of rooms of which consists of 37 rooms of different categories. 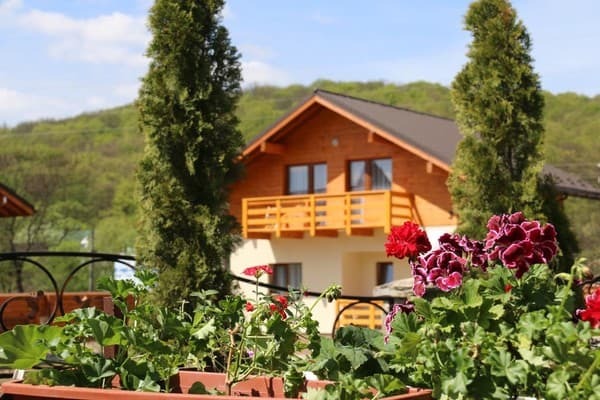 Each room is equipped with furniture from natural wood, TV, air conditioning, refrigerator, hairdryer, free Wi-Fi, as well as its own bathroom and toilet. Description of the room: The rooms are decorated with modern furniture made of natural wood. Each room has an exit to the balcony from which a beautiful landscape opens. The area of ​​each room is 35 square meters. Description of the room: Double room with a large French bed with orthopedic mattress. Room size - 35 sq. M. The room has an exit to the balcony, from which a beautiful landscape opens. Description of the room: The room is equipped with a comfortable double bed and a single bed. 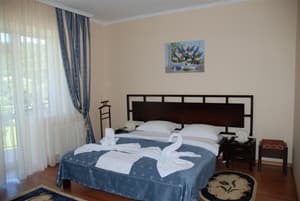 Description of the room: Two-room suite with a double French bed and a furnished living room with a soft part consisting of a convertible sofa and two armchairs. The room is furnished with modern furniture made of natural wood. The room area is 60 meters. "Все в одном" Вы можете спуститься с номера в шлепках и халате на первый этаж к бювету, а еще ниже - СПА зона: (гидро- и обычный массаж, инфракрасная и обычная сауны, небольшой бассейн (включено в проживание. Тут, как правило, мало людей), соляная комната, хвойные и соляные ванны, бочка. В здании есть и ресторан. Готовят вкусно. А вот цена - кусается. Можно оплачивать все картой. Для детей есть детская комната и бесплатно предоставят детскую кроватку. На заднем дворе помимо детской площадки есть 3 беседки над рекою (у леса). В них - летняя кухня или мангал. В этот раз в номере вентиляция в сан узле почти не работала. Гладильную доску в коридоре можно было бы заменить на новую. ПРЕКРАСНОЕ МЕСТО НА ЗЕМЛЕ! МНОГО ЗЕЛЕНИ! УХОЖЕННАЯ ТЕРРИТОРИЯ! ПРЕКРАСНАЯ КУХНЯ! Остались довольны отелем. Персонал, номер, пакет услуг - все ок. Некоторые особенности. В данной местности хорошо зарабатывают на питании. Цены будут не ниже Киева. Если будете останавливаться в этом селе, то отель "Фантазия" - самое то. + еще в самом отеле можно заказать трансфер в Берегово или Косоно: цена та же, но Вы платите кредиткой ;) В их ресторане очень вкусный рулет с маком (сами делают). Рекомендую. Children under 5 years are accommodated free of charge in one room with parents without extra beds. The cost of additional space is 130 UAH in the apartments, in the hotel - 200 UAH (Euro clamshell with orthopedic mattress). Breakfast is included in the room rate. There is a restaurant on site. 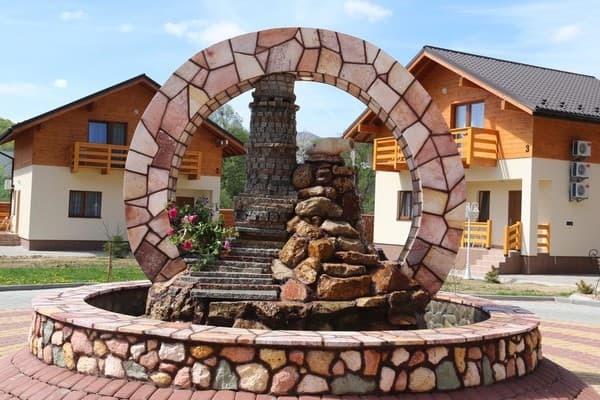 The cost of lunch or dinner is 95 UAH, and the apartments have a kitchen for self-cooking. A grocery store is 3 minutes away. The hotel "Fantasy" is located in with. 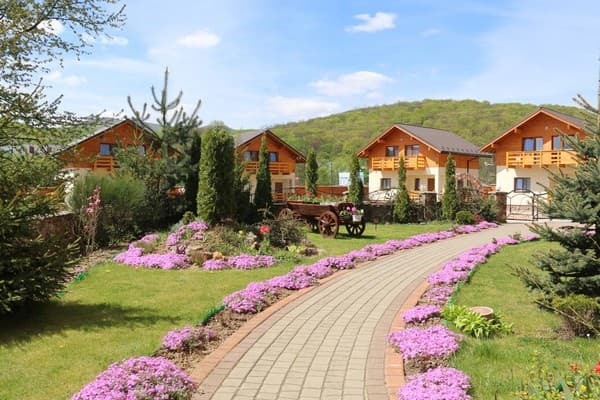 Polyana, at a distance of 11 km from the railway station of Svalyava, 35 km from the city of Mukacheve, 75 km from Uzhgorod. Bus connection - from bus stations in Svalyava, Mukachevo and Uzhgorod. The nearest ski lift is 2.5 km (Mount Vedmezha). The main method of treatment is the use of carbonic hydrocarbonate-sodium water from Polyanskiy source "Polyana Kvasova", which is used for drinking treatment and baths. The resort specializes in treatment: diseases of the digestive system; stomach ulcers and duodenal ulcers, metabolic disorders; obesity, diabetes mellitus; associated cardiovascular diseases; urogenital pathologies; pathology of the lungs and bronchi; chronic liver disease, gallbladder. In the beautiful hotel Fantasy, you can pamper your body and soul with wellness, relaxation and restorative procedures at the hotel's SPA. How to get from Kiev Option 1. By train Kiev-Chop or Kiev-Uzhgorod to Svalyava station, then by shuttle bus or bus to the village of Polyana (9 km). 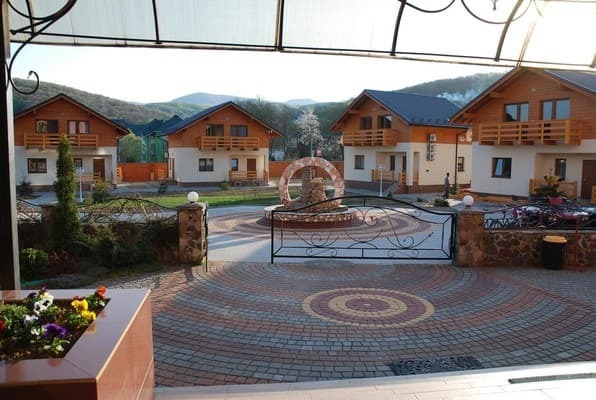 Transfer Svalyava-Polyana can be booked at the hotel (with prior notification of arrival). Option 2.